I was born in Bonn, West Germany, and emigrated to Cape Town, South Africa with my parents in 1965. I went to school at the German School, Cape Town and then studied for six years at the University of Cape Town (psychology and languages, B.A. Hons and H.D.E./P.G.Sec.). Worked as bouncer at a variety of clubs close to the waterfront during my student years. Was married in 1986 and divorced in 2002. Have two wonderful children. Beginning in my childhood, my life has been defined by my interest in the Eastern martial and healing arts. Since my interest was not attached to any particular style but rather to areas of study such as “efficiency in combat”, “movement and fitness” and, later, “personal development, I studied a broad range of systems, looking for core principles and achieving instructors ranking in several of these methods. At age ten I began studying Judo. Experimented with Jiu Jitsu. Switched to Karate at fourteen. At fifteen or sixteen years of age, I discovered I had a talent for massaging, I began giving shoulder massages to my mother’s circle of friends, on the basis of apparently having “good hands”. I represented UCT in Karate ( silver medal at the National Universities championships) and also started studying Tai Chi in 1978 (First with Fred Rosenthal, then Rose Mann). 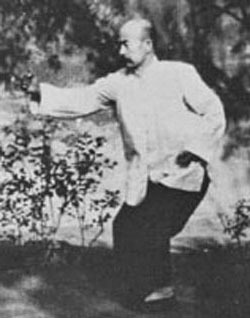 My Tai Chi studies really took off in 1982 when I began studying the art with Mr. Fok, Si Yue, in exchange for working on weekends in his restaurant, the “Dragon Inn”. I studied as a private student with Mr. Fok for just under ten years and was encouraged by him to begin teaching in 1986. In 1983 I also started studying Jiu Jitsu/ World War II Combatives with Harry Snowise, who is my mentor to this day. I also began studying Swedish massage at that time. In 1993 I further expanded my internal arts repertoire by becoming a student of Dr. Lin, Feng Chao for four years (Hsing I Chuan and Ba Gua Zhang). I started studying Brazilian Jiu Jitsu around this time after seeing the first UFC. I was lucky, the Brazilian consul in Cape Town was a twenty year practitioner and was looking for training partners. This led me to a couple of trips to Rio de Janeiro, where I met and had the priviledge of studying with the masterful Orlando Cani, the inventor of the Bioginastica method of physical training, who was Rickson Gracie’s movement coach. In 1995 I quit my job and spent half a year in Thailand, studying Nuad Phan Bo Rarn (traditional Thai massage), mostly in Chiang Mai with Chongkol Settakorn but also with other teachers, both in northern Thailand and in Bangkok. I was certified not only as a massage therapist but also as a teacher of Thai massage. I also picked up some Muay Thai clinch techniques when I was in Thailand. Arriving back in Cape Town I earned my living as a massage therapist for a couple of years. I met Nigel February in the mid nineties and started studying Piper knife system with him. Trained in boxing with Lakis Campanis from 1999 to 2001. Between 1997 and 2002, I taught many seminars internationally (Europe and Israel). Articles by me have appeared in magazines in various countries (Black Belt magazine, USA, Tai Chi magazine, Australia etc). In 2003 my first book (on the art of Jiu Jitsu) was published by New Holland Publishers of London and in 2006 my second book, on Thai Massage, was released by the same publishers. In 2006 my first book was also published in the USA, as well as being translated into several languages. I taught internal martial arts seminars in Israel and Germany. I taught further seminars, on both clinch-work and Piper in Denmark and England at the end of 2006 and recently in Holland and Germany.